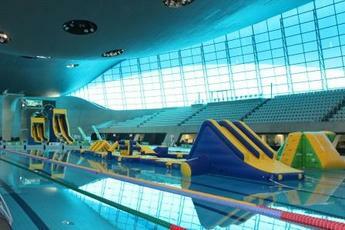 Fun for all the family at the London Aquatics Centre. The London Aquatics Centre is the perfect place to go for a family swim. We have lots of facilities to make swimming fun for everyone. The 50m long Training Pool, known as the 'hidden pool' during London 2012, is split into two 25m pools with the floor raised to a safe and shallow depth perfectly suited to children and less able swimmers. We have plenty of family and unisex changing rooms, a dedicated buggy parking and a family locker room. 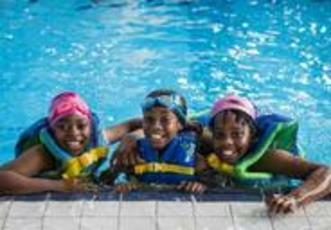 Price for a swim start from £4.95 for adults and £2.50 for children aged three and above. 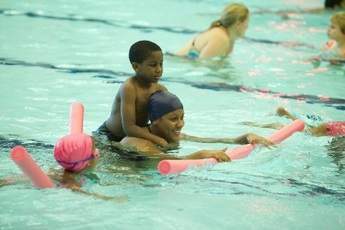 Plus, children aged under three are able to swim for free. 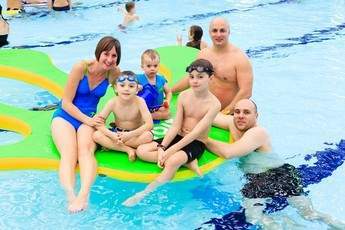 Bring the whole family along to one of our Swim for Family sessions, ideal for splashing around and having some fun. Children under 16 must be accompanied by an adult and swim safety rules apply. Children aged under three can swim for free. Located in the Training Pool, our Swim for All sessions provide a general swim session for anyone looking to just enjoy the water in an open, un-laned environment. Children under 16 must be accompanied by an adult and swim safety rules apply. 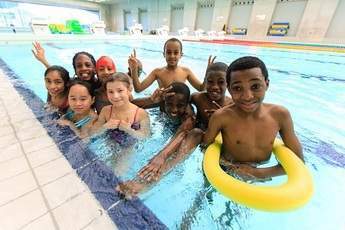 Children aged under three swim for free. We have three version of our inflatable Aqua Splash sessions which offers something for all ages and swimming abilities. All Ultimate Aqua Splash and Extreme Aqua Splash sessions are availalbe during school holidays and ocassionally on Sundays. Our smallest inflatable obstacle course is available as a 20 metre wipe-out course 'Aqua Splash' set in shallow water. This sessions is aimed at families with kids over the age of 5 and for swimmers who aren't competent swimmers yet. Our 40 metre long 'Extreme Aqua Splash' inflatable obstacle course in the Competition Pool, is designed for families with kids over the age of 8 who are competent swimmers. The Competition Pool's water depth is set to 3 metres deep, this session involves a lot of swimming so is only for competent swimmers who can swim over 100 metres in one go in deep water. This session does not include the Dive Pool inflatables. Our largest version of the aquatic inflatable assault course fun, Ultimate Aqua Splash, has two inflatable slides coming off the 3m and 5m dive platforms into the Dive Pool, a new Aqua Run on the Dive Pool as well as the 40 metre long obstacle course in the competition pool. Ultimate Aqua Splash is the UK's largest indoor inflatable aquatic experience. Children must be aged at five years plus for Aqua Splash and eight years plus for Ultimate Aqua Splash as well as be able to competently swim 100 meters. Tickets cost £5.00 for children and £7.50 for adults for Aqua Splash. Tickets for Ultimate Aqua Splash cost £7.50 for children and £10 for adults. There is a £2 spectator fee charged to anyone wanting to come into the centre to watch any of the Aqua Splash sessions. Please also note that the images displayed online may not reflect what inflatables will be available on the day. Tickets go on-sale approximately three weeks in advance but this may vary slightly. These sessions sell-out quickly so we recommend booking in advance.